Jeremy Brecher's excellent account of the overlapping American miners' strikes in 1894: a national strike and a successful stoppage in Cripple Creek, Colorado. The United Mine Workers had no more than 20,000 members, but on April 21st, more than 125,000 miners struck.5 The strike eventually reached from Tacoma, Washington to Birmingham, Alabama, to Springhill, Nova Scotia, including many areas where the U.M.W. had no organization whatever. 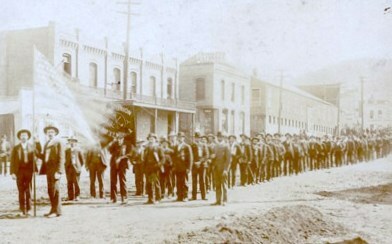 Andrew Roy, a miners' union official, reports that even "the general officers were surprised at the magnitude of the strike. . . "6 According to the U.M.W., no more than 24,000 bituminous miners remained at work in the entire country. At Duquoin, Illinois, 700 miners captured a freight train and forced the engineer to take them to Centralia, where they sabotaged a mine that had begun work there. "The shaft was filled with loose material, the belting on the machinery was cut, and the oil cups knocked from all the shafting. "27 The militia was sent in and at least eighty-eight men were arrested. Of course, violence was by no means always necessary to persuade strikebreakers to quit. When the Baltimore and Ohio Railroad ordered its shopmen and its Italian trackmen to replace the striking miners, they refused and were fired.28 At the Elm Grove mines near Wheeling, West Virginia, the operators imported four lots of strikebreakers, only to have them quit one after another. The Populist Governor of the state finally negotiated a settlement establishing the eight-hour day, but the army of deputies remained in Cripple Creek.65 Only by sending the militia and interposing them between the strikers and the deputies was a new engagement prevented. Under militia guard, work began again, but it was only a truce. In less than ten years, Cripple Creek and Colorado would again be the center of a bloody mine war. Excerpted from Brecher's excellent book, Strike!, and lightly edited by libcom to make text work as a stand-alone article. 1. Hon. Andrew Roy, A History of the Coal Miners of the United States, from the Development of the Mines to the Close of the Anthracite Strike of 1902, 3d Ed. (Columbus, Ohio: J.L. Trauger Printing Co., 1907), p. 302. 2. New York Times, April 22, 1894. 3. New York Times, April 13, 1894. 5. Commons, Vol. II, p. 502. 7. New York Times, May 1, 1894. 8. New York Times, May 10, 1894. 9. New York Times, April 24, 1894. 10. New York Times, May 29, 1894. 11. W.T. Stead, "Incidents of Labour War in America," in The Contemporary Review (July 1894), p. 67. 12. New York Times, May 1, 1894. 13. New York Times, April 30, 1894. 14. New York Times, May 5, 1894. 15. New York Times, May 10, 1894. 16. New York Times, June 2, 1894. 17. New York Times, May 26, 1894. 18. New York Times, May 25, 1894. 20. New York Times, May 26, 1894. 21. New York Times, May 25, 1894. 22. New York Times, May 24, 1894. 24. New York Times, May 25, 1894. 27. New York Times, May 25, 1894. 28. New York Times, May 1, 1894. 29. New York Times, May 25, 1894. 30. New York Times, May 27, 1894. 31. New York Times, May 28, 1894. 35. New York Times, June 4, 1894. 36. New York Times, June 5, 1894. 40. New York Times, June 10, 1894. 41. New York Times, June 5, 1894. 42. New York Times, May 29, 1894. 43. New York Times, June 5, 1894. 44. New York Times, June 7, 1894. 45. New York Times, May 29, 1894. 46. New York Times, June 5, 1894. 47. New York Times, April 29, 1894. 48. New York Times, May 1, 1894. 49. New York Times, May 6, 1894. 50. New York Times, May 11, 1894. 51. New York Times, May 13, 1894. 52. New York Times, May 24, 1894. 53. New York Times, May 25, 1894. 54. New York Times, May 28, 1894. 57. New York Times, May 30, 1894. 60. New York Times, June 14, 1894. 62. New York Times, May 13, 1894. 63. New York Times, May 3, 1894. 64. New York Times, May 5, 1894.